The Holy City has no shortage of great bars at which you can whet your whistle. 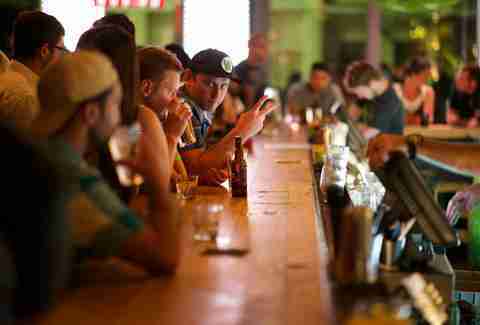 Sometimes, deciding which bars are worth visiting can seem like quite the undertaking. 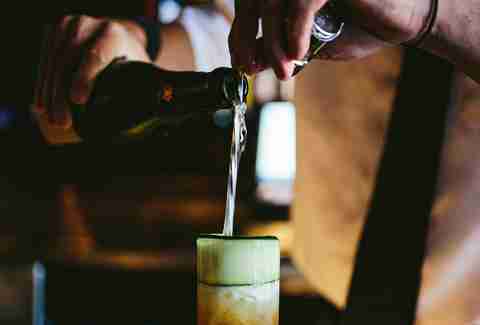 Fortunately for you, we’ve sampled beverages at different spots all across town -- from dive bars to upscale lounges -- to create this diverse list of Charleston drinkeries, perfect for whatever adventure your night may bring. 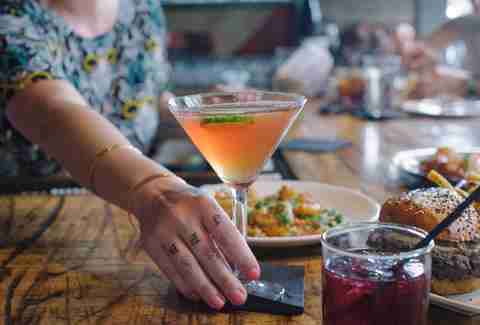 1Kept may have only opened its doors earlier this summer, but it’s already made a big impact on Charleston’s dining and drinking scenes. It’s currently the only place in Charleston serving up cold brewed cocktails -- a slow-drip-infusion process that looks like a science experiment happening behind the bar, and it takes 36 hours to complete. The result is a flavor packed-cocktail that’s bright and refreshing and has absolutely nothing to do with coffee. Our favorite is the Charleston Tea Old Fashioned which features HillBilly bourbon, Charleston Tea Plantation Earl Grey, black cherry, and clementine peels. The Gin Joint offers up all the makings of a perfect romantic night out: softly lit, with unobtrusive music, and of course, sinfully delicious mixed drinks. The cocktail menu leans heavily on the eponymous spirit, but the bar is stocked with other popular liquors as well (just don’t ask for anything with vodka). Not sure what to order? Ask for the bartender’s choice for a one-of-a-kind cocktail crafted just for you. 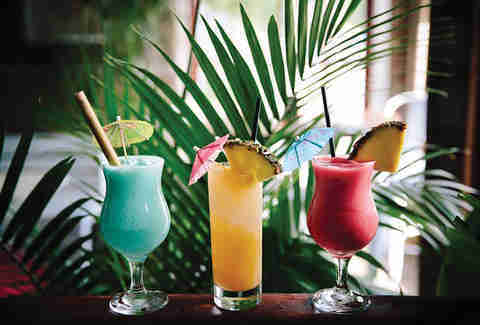 Charleston might feel a little chilly outside right now, but inside Cane Rhum Bar, it’s like summer never left! The brightly colored walls, leafy green palm trees, and upbeat island-inspired music make you feel like you’ve jetted off to the Caribbean for the weekend. Rhum chef Paul Yellin has crafted food & drink menus with authentic island flavors and ingredients to chase the chill away. 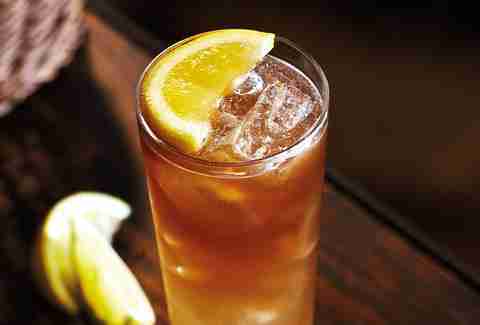 One solid, go-to drink is the Instant Vacation, made with lemongrass and ginger-infused Mt. Gay rum, Falernum, orange, lemon juice, and a house-made ginger beer topper. Bay Street Biergarten is a lively, energetic beer bar inspired by German-style biergartens found throughout Bavaria. The outdoor patio features giant picnic-style tables, lawn games, and, when the weather’s nice, an almost constantly packed bar. Inside, you’ll find self-serve beer taps, comfortable booths, and a bar serving up local and regional brews and craft cocktails. Between the monthly pop culture-themed trivia nights, the puppy brunches, and broadcasts of the latest sports games, there’s always something fun happening at BSB. We’re not sure there’s anything that could stop people from going to Recovery Room; it’s an evergreen haunt that Charlestonians will continue to frequent decades into the future. It’s like that little cockroach from Wall-E: the world might be completely deserted, but Rec Room will still be up and running, slinging PBRs to anyone who’s thirsty enough to want one. The dark wood paneling, low light, and head bartender Teddy Nixon’s proclivity for whiskey-based cocktails — including a Low Country-inspired fall cocktail called the Fairgrounds (made with Woodford Reserve Double Oak, clarified apple juice, sherry, Cardamaro, tiki bitters, and salt) —give Mash a cozy, romantic feel. They also keep things lively and casual with an indoor bocce court, jukebox, and live music a few nights a week, making it an ideal spot for whatever mood you’re in. Sometimes there’s nothing better than a classic Old Fashioned that will warm you from your belly to your toes. And when it comes to the perfect Old Fashioned, it’s hard to beat the one found at upscale lounge The Cocktail Club. The At a Time Like This (made with Tito’s Vodka, fresh grapefruit juice, cinnamon, thyme, and a splash of prosecco) is also a great choice if you prefer a non-whiskey-based cocktail. Obsessed with The Cocktail Club? Join the VIP list for all kinds of cool discounts and special events. 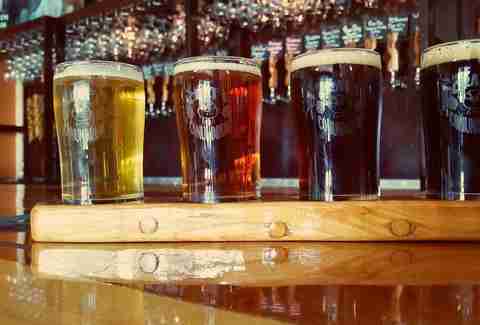 Those of you who are really into craft beer should plan to spend a few hours at CFB. Sidle up to the bar or settle into one of the leather chairs near the (unfortunately fake) fireplace and try a liter of your favorite seasonal brew, or one of the 41 other beers on tap here. Pair it with the Pork Slap sandwich -- or one of the other delicious menu items -- and you’ve got the makings of a perfect night out. Those looking to stay in comfy clothes like flannel shirts and jeans all year long will find their people at AC’s. Plan to head there for Sunday brunch, which celebrates a new theme every week (paying tribute to a wide range of pop culture, where everything from Golden Girls to Game of Thrones is fair game). The beers are cold, the mimosas are 98% Champagne, the shots are cheap, and the bartenders are efficient and no-nonsense. Warehouse changes up its cocktail menu on a pretty regular basis, depending on the season and what the bartenders are feeling at the moment. In addition to regular house cocktails, you’ll also find cocktails made to split (think: a pitcher of your favorite cocktail), two different sangrias, as well as the fusion of beer and liquor known as the “beer cocktail.” Here’s what you should drink if you’re feeling adventurous: the Back in Black, made with Holy City Pluff Mud Porter, bourbon, ginger snap, orange, and maple syrup. 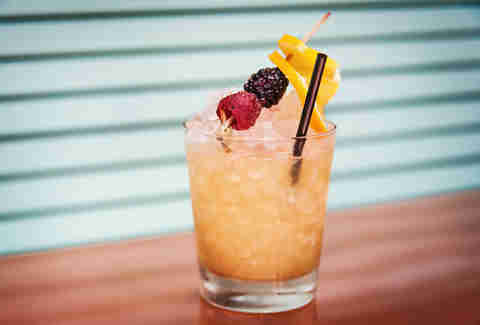 Oh, and did we mention that their cocktails are just $5 during happy hour? They say that some like it hot, and if you’re one who likes their cocktails with a little heat, then Burwell’s is the bar for you. The Mexican Campfire cocktail is made with Herraduras tequila, Laphroaig, Ancho Reyes, grapefruit, lime, and blood orange syrup, and it will tickle your tongue and give you that warm, fuzzy feeling. The bar at Burwell’s is trendy, yet comfortable, making it the perfect stop for an after-dinner nightcap. 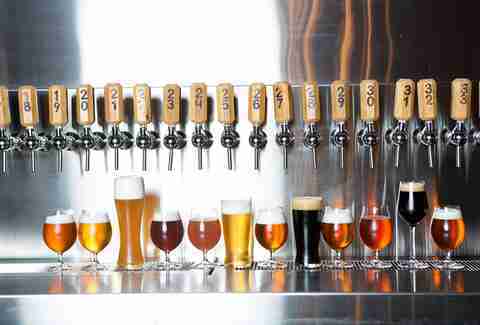 Beer lovers will rejoice over the giant wall of beers offered at Edmund’s Oast. Whether you’re into something dark (like the Prairie Bomb! Deconstructed Chili) or a more unique brew (try the house-brewed peanut butter & jelly beer), you’ll find your perfect seasonal suds and unusual cocktails here. Pair it with some of the house-cured charcuterie, and you might never want to go home. 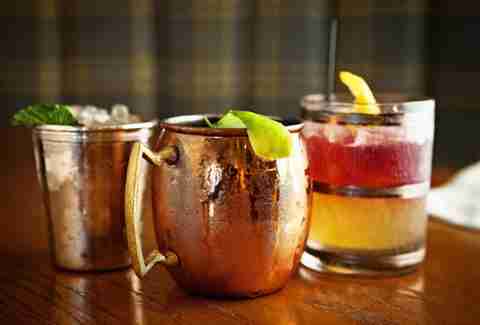 There’s something about a Moscow mule that appeals to every season, and the best mule in the Holy City can be found at Rarebit. The dark, comfy booths, retro-style lighting, and bartenders who make complicated cocktails at lightning speed all come together to make you feel like you’ve found an intimate escape, even when the place is at capacity (which happens pretty quickly). 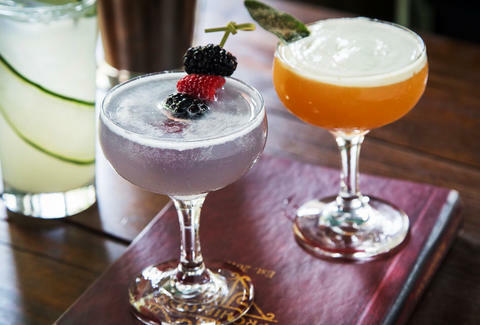 Prohibition’s name might imply otherwise, but the cocktail menu is full of creative and unique mixed drinks that appeal to any palate (assuming that palate drinks alcohol). 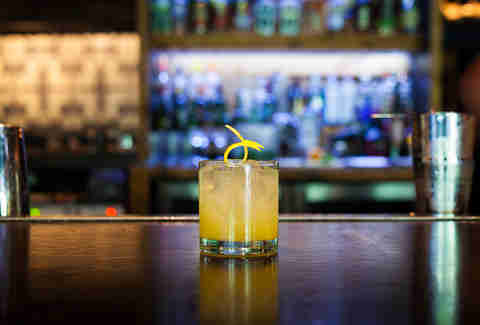 Try the Bourbon Thyme with Granny Smith apple-infused Jim Beam, lemon, Aperol, thyme, honey, and orange bitters for the perfect palate-pleasing drink. And if that doesn’t do the trick, get out on the dance floor. After all, what goes better with cocktails than dancing? The craft cocktail and “real good beer” menu at Proof is one of the biggest in Charleston, which means the odds of finding a drink to match your unique personality are pretty heavily in your favor. Not finding exactly what you want on the menu? 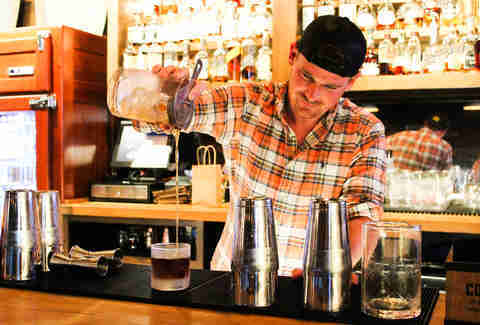 Not a problem, as owner/bartender Craig Nelson and company can fashion practically any cocktail your heart desires. Just tell them what flavors you like and they’ll make it happen. The space is intimate and dark and overlooks King Street, which makes it perfect for date night. 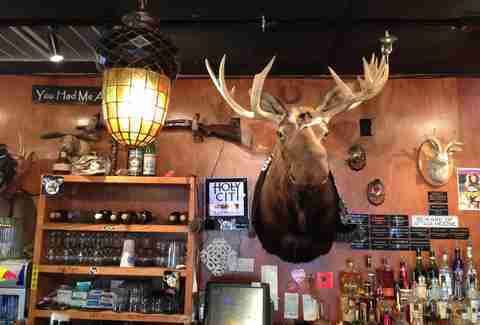 Both the Johns Island and Downtown Tattooed Moose locations are just generally fun bars to hang out at and drink leisurely while getting your game on. In addition to board games and arcade games, the bar often features live, local musicians or broadcasts your favorite sports team. If the weather is nice, plan to sit out on the patio and enjoy your drinks al fresco. 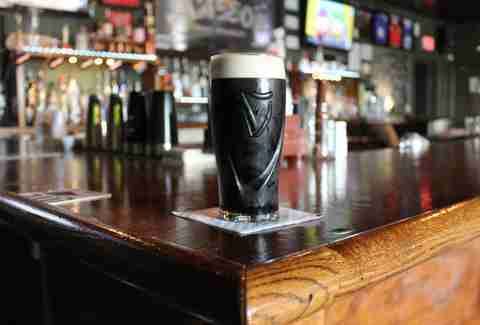 When it comes to darker liquors like whiskey, bourbon, and Scotch, you can bet that an Irish pub like Seanachai has a decent selection of all three. Order up some of that good stuff, or try your luck with the cocktail of the week, made with ingredients picked fresh from the Johns Island Farmers Market (or Seanachai’s own herb garden). Sip your drinks inside the warm Irish pub interior or take them outside around the fire pit (if there’s any room!). Whenever you’re not avoiding the outdoors in favor of Netflix, head over to the Alley for beer and/or cocktails and a rousing game of bowling (don’t forget to bring socks!). Whether it be for the Studio 300 party, the Big Lebowski Bash, or just for a fun night out on the town, The Alley is one bar you should definitely pin to your list for a strikingly good time -- sorry, but those puns were completely justified. 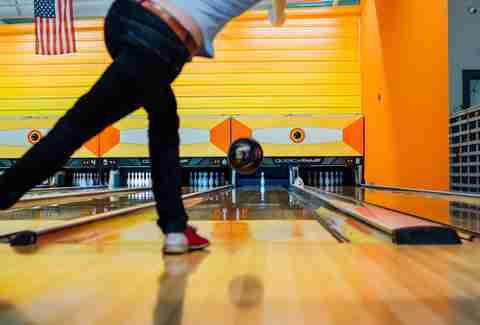 Remember, they show bowling on ESPN, which means you can also count this as exercise for the day. Although Craft Conundrum is a super low-key spot to hang out after work, beer is serious business here. 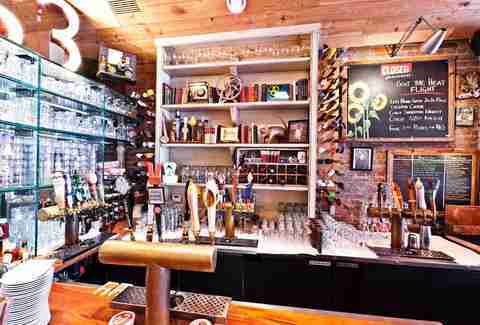 You may truly have a drinking conundrum upon arrival, thanks to the more than 100 beers on tap, but the affordable drinks and staff who really knows their beer will quickly turn this confusion into a cause for celebration. The bar doesn't serve food, but if all that drinking works up your appetite, the bartender will let you order a pizza or bring in food from one of the many food trucks that often visit. Dig in the Park is arguably one of the most fun bars in all of Park Circle, and perhaps in the entirety of North Charleston. Anytime you walk by, the patio looks like a party you wish you’d been invited to, often featuring live music, trivia competitions, live sporting events on TV, or just a general air of camaraderie. Stop by for a happy hour drink (or two) during the week from 4pm-7pm for $2.50 select drafts and $3 house liquors! The comfortable atmosphere at the Belmont seems to be magically appropriate for every season. We’re not sure if it’s the black & white movies projected on the wall, the fact that there’s a limit on the number of people allowed in at a time to give it more of an intimate feel (seriously), or the artfully crafted cocktails that make us love the Belmont so much, but they all work together to really get you in the mood of the season. Pro tip: pair your fresh-pressed mint gimlet cocktail with a house-made banana and Nutella Pop-Tart for a truly indulgent evening. This unique locals’ bar/restaurant exists in an area most often associated with tourists and generic fried seafood. 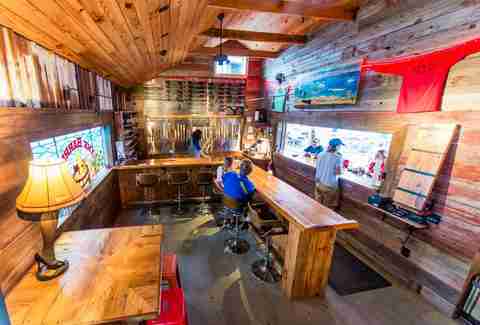 Luckily, Jack of Cups isn’t afraid to break the mold and be different, and it’s also got the best beer selection on Folly Beach, with both local and regional brews, plus a decent selection of red and white wine, at prices that’ll make your wallet (and taste buds) jump for joy. The Barrel was made for people whose love for craft beer is exceeded only by their love for man’s best friend. Featuring 33 local and regional beers on tap and a waterfront backyard that welcomes both humans and dogs (and the occasional goat), The Barrel is sure to become one of your favorite spots to spend an afternoon. And when the weather starts to get a little nippy, gather around The Barrel’s fire pit to stay comfortably toasty. 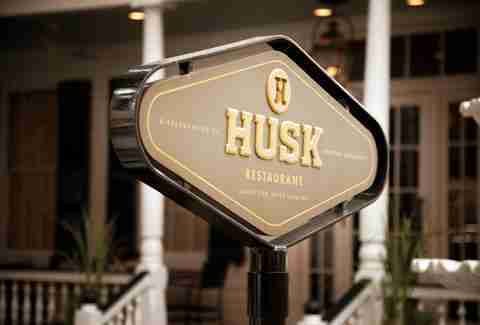 Much like chef/owner Sean Brock, the Bar at Husk has a real passion for the brown water -- it features more than 50 premium bourbons, ryes, and Scotches that are delicious -- whether on their own or in one of the signature cocktails. 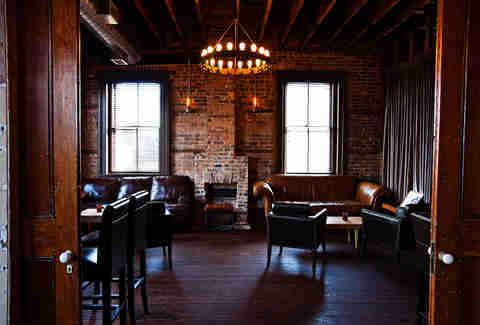 The atmosphere is especially unique, capturing true southern essence with its faux-thatch roof and exposed brick walls that make you feel like you’ve been transported back in time a century or two. Pro tip: order the burger and a barrel-aged Manhattan for a truly transcendent experience. Sydney Gallimore is a food writer from Charleston, South Carolina whose favorite drink is a Moscow mule. Follower her adventures on Twitter @Sydney_Inc.